Is Britain “scared of Halloween”? My God, what is happening to the United Kingdom? 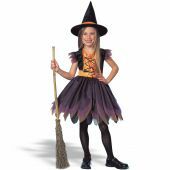 Brits, who are frightened by the idea that Americans can possess guns and write comments on this blog saying so, are scared of kids dressed as witches asking for peanuts? At least millions of gun-owning Americans are happy to see the kids in their neighbourhoods out enjoying Halloween. A frightened populace does not a firearm, or a national holiday, make. And it isn’t only the authorities are are terrified of Halloween, apparently. As Stephen mentioned in his post on Dumbledore‘s sexual orientation, churches and religious groups seem to regard any mention of magic in folklore, no matter how patently fictional or socially lighthearted, as evil. O-kay. Finally, O’Neill points out the third major group who seem to disapprove of the ghoulish festivities: the greens. They’re recommending that people reduce or eliminate their kids’ carbon footprints this Halloween, including the suggestion of using treats sans wrappers. Wonderful, isn’t it? Astounding. I enjoy Brendan O’Neill’s articles and I recommend them to all our readers. Not sure either…. I haven’t had any problems. Let me know if it happens again, and anyone else having problems posting comments. I was looking through reason magazine (one of your links on the left) and they have a similar article about Halloween, adding a few people who disapprove of it including REAL witches of the Wiccan religion who are mad at the caricatures! I remember even when I was at school the local churches objected to Halloween and held a “Rainbow Party” instead. This was before the rainbow came to symbalise the gay pride movement. Guy Fawkes was always the big night for us where i grew up in the peak district, doesn’t seem to be very popular here in Northern Ireland because of the political / religious implications. There has been a problem in the UK with older kids, teens etc using trick or treat to simply demand money with menaces. There is an answer to this, as there is to many problems. ENFORCE THE EXISTING BLOODY LAWS (excuse caps). And let kids have a bit of fun. If you’re really put out by young children knocking on the door just don’t answer it. My eldest child’s birthday is October 28 so she was three days old on her first Halloween. I didn’t want to be bothered so I just turned the lights off at the front of the house and closed the door. Simple action, end of problem. Repeat, deal with genuine law and order issues by use of our copious existing laws. All this surveillance is an excuse for craven police and authorities to fail to address genuine lawbreaking while harassing decent people. Sorry for the rant. Liam it’s ok, we like ranting around here. Keeps the blood pumping and who knows, maybe more would get done if more people ranted? Agree with all you said.